Ken Keeley has taken his artwork to a new level. He is currently producing an authentic limited graphic edition, executed and guaranteed as represented in the form of 3-D lithographs, utilizing three of his original paintings. 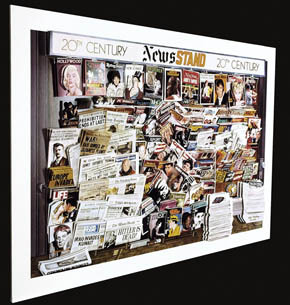 "Hollywood Newsstand" a 3 dimension lithograph sized 31" x 24" which is personally signed and numbered by the artist, Ken Keeley in an edition of 350 and a/p edition of 25. "Times Square after 911" a 3 dimension lithograph sized 22" x 34" which is personally signed and numbered by the artist, Ken Keeley in an edition of 350 and a/p edition of 25. Ken is proud to announce that his wife, Grace Keeley, is the 3-D art designer. Each 3-D is individually created allowing for the professionally completed creation to be "one of a kind" since no two are exactly the same. They are packaged and shipped unframed along with their certificate of authenticity.